Question: What could you do with 3D scanning? More specifically, if you could 3D scan anything to recreate it, archive it for posterity, start a business, memorialize it, repair it, or if you could 3D scan anything just for fun, what would it be? This question was at the core of Geomagic's November 30th presentation to 5th grade students at Weatherstone Elementary School in Cary, N.C. And as you can see above, the next generation of makers was keen to give us a few answers. Prior to the Weatherstone visit, the school's principal, Tim Chadwick, and assistant principal, Lori Nelson, visited Geomagic's office where they were scanned into 3D. Those scans were then used to produce custom Pez dispensers because what student wouldn't want to see his or her principal as a Pez head? At the event, in one of three presentation rooms, Richard Lam and Arun Kunjur gave a brief overview of scanning, and they presented the Pez heads as an example of what 3D technology can do. Following their presentation, students were treated to a live demonstration using the Microsoft® Kinect™ device to scan student volunteers. "Cool" and"wow" were the words of choice as students watched their image being transferred into 3D space. Biomedical applications were the topic in a second classroom, where Yates Fletcher presented an alternative to uncomfortable, itchy arm casts, a form of torture that many 5th graders have had to endure. After injuring his wrist in a bicycle accident, Yates created a lightweight, removable, custom cast, which students were able to see along with the process behind it. Afterward, they passed around several amazing prosthetic fairings made by Geomagic customer Bespoke Innovations. Finally, at the day's most popular exhibit, each student was able to test out the Geomagic® Freeform® 3D sculpting application and Sensable® Phantom® Desktop™ haptic device, which allows users to"touch" virtual 3D objects. Under the supervision of Senior Custom Software Development Specialist Richard Sandham, they carved virtual clay, stretched it and painted it. "It feels weird, squishy," said one 5th grader after punching holes into a cube of digital clay, making a classic piece of Swiss cheese. Squishiness aside, many saw the practicality of the Freeform system. Said one student,"If you mess up, you don't have to redo the whole thing. Just press Control Z. ""And," added another,"you don't have to get clay all over your hands. I'd love to get this for Christmas." So true. The presentation was part of Weatherstone's STEM curriculum enhancement program, which provides students with project-based learning about applications of science, technology, engineering and math. And Geomagic is in a great position to show students how they can blend geometry, computer science, fine arts and biology. 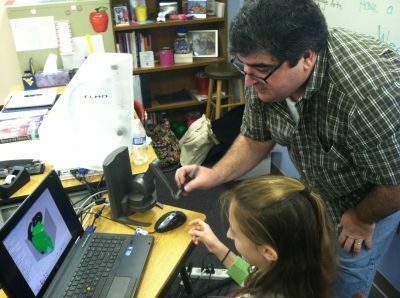 "Partnering with Geomagic allows Weatherstone students to see how the work they are currently doing in school can lead to imaginative careers in science, technology, engineering and math," said assistant principal Mrs. Nelson. "Students were shocked by how math and science are integrated with art and then being used in the real world." In his latest blog, our COO and President, Tom Kurke, stressed that it was important to encourage the newest generation of makers and to"try to find ways to expose more kids to the capture/modify/make ecosystem." Because the future's successful designers, manufacturers, engineers, and architects will be those whose ideas can flourish amid resources that open doors rather than close them. 3D technology, for design, manufacturing, training and research, is at the heart of this movement. And events like Weatherstone's STEM Friday provide a great avenue for getting future makers to start thinking about what they're capable of creating. There's more to the story, so stay tuned. Each Weatherstone 5th grade student was asked to propose an original design that they could make using 3D technology. With help from Geomagic, Weatherstone faculty will select several exceptional designs that will then be developed and prototyped by Geomagic. Check in later to see what our Weatherstone designers have in mind. As Mrs. Nelson said,"We're excited to see what imaginative ideas the 5th graders at WES come up with on their own." We at Geomagic couldn't agree more.